Well, this is a bit awkward. It's not just the United States that wants more women in positions of power, both economic and political — Japan's Prime Minister Shinzo Abe is embracing a so-called "womenomics" policy. It's good news — it's intended to increase the economic opportunities of Japanese women, and at least somewhat break up the country's historically male-dominated business culture. Abe appointed two new female cabinet ministers last month, but now things have fallen apart: both female cabinet ministers have resigned. This has badly hurt Abe's Womenomics policy. Not to mention, it's tarnished the legacy of the woman once thought to be Japan's best chance for a female leader, Yuko Obuchi. Basically, the two ministers in question opted to resign for rather different offenses, but both are out, all the same. The first resignation came from Trade and Industry Minister Yuko Obuchi, who Abe appointed in September with an eye on thwarting Japan's years-long stretch of economic stagnation. Obuchi was considered something of a rising star in Japanese politics — as detailed in-depth by the Washington Post's Anna Fifield, she was widely regarded as a contender to be the country's first-ever female Prime Minister, breaking a glass ceiling in political leadership that's all-too familiar even here in America. But her tenure as a minister in Abe's cabinet was only fated to last a little longer than a month. Despite the vote of confidence from Abe, Obuchi's career has been apparently derailed by allegations of improper use of political funds. While there's no telling for sure whether this is a death sentence for her future prospects, it certainly can't help matters. She resigned Monday, giving a televised statement. As a member of the Abe cabinet, I feel sorry that I could not contribute anything to various issues such as the economic recovery and the realization of a society where women can shine, and I apologize. As minister of METI, it’s unforgivable for my personal issues to cause economic policies and energy policies to stagnate. I resign here and would like to put all my effort into regaining everyone’s trust by investigating these doubts. People expected a lot. I regret I could not play any role, and I feel sorry. While one high-profile resignation would've been bad enough, Abe was then faced with the reality of losing two in just one day. 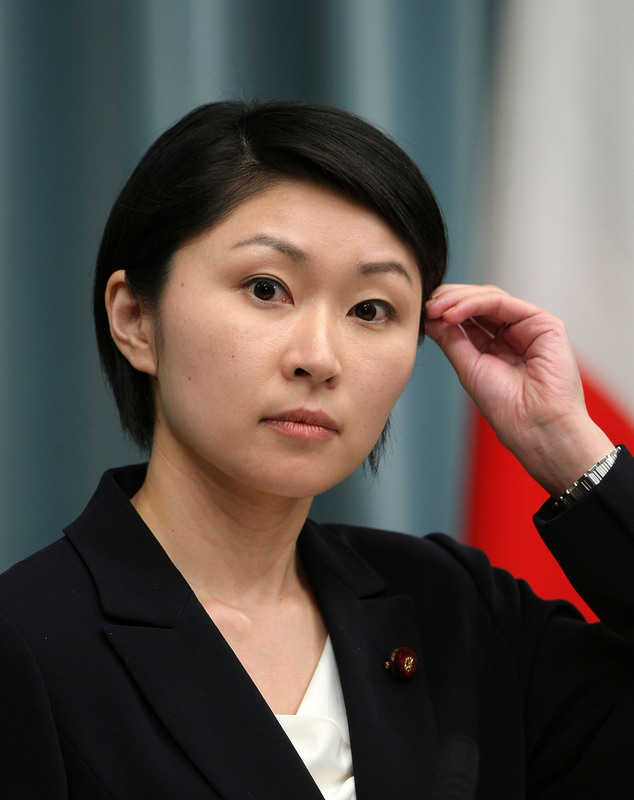 Justice Minister Midori Matsushima followed Obuchi's example by resigning Monday. Her alleged offense? Well, it likely sounds a little more unusual: she gave away thousands of paper fans to potential voters during the summer, bearing a drawing of her likeness. I feel sorry that my recent words and actions caused political and administrative stagnation. ... I myself do not think I did anything that violates any law, but I am resigning as I don't wish to cause any more paralysis. So, in short, not a fantastic day for the Japanese government. And while Abe's public support has been strong throughout his current stint as PM (he also served previously from 2006 to 2007), the impression of a cabinet in-flux could hurt his political strength, especially with another two ministers already in hot water. According to The Guardian's Justin McCurry, Internal Affairs Minister Sanae Takaichi and Liberal Democratic Party policy chief Tomomi Inada both posed for photographs with Japanese neo-Nazi Kazunari Yamada. Both women have since denied they had any knowledge of the man's far-right politics when they took the pictures, but it's proved understandably controversial nonetheless.